Think the desert is boring? Think again! Our 4X4 off road desert loop tours are anything but boring and not for those that want a smooth ride. 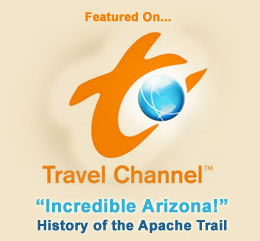 Join us for an experience unique to this area of the Sonoran desert. Hold on as you crest rock peaks and slide down the other side. 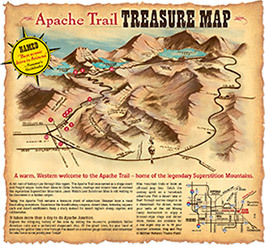 Available year round, this rugged ride will take you through desert riverbeds and over trails from the gold rush days of the 1800’s. Keep your arms and legs in – you’ll be amazed at the flora and fauna the desert calls home. You may bring your own alcohol on the 4×4 desert adventures, but NO glass. Only beverages in cans or plastic are permitted. Prices Do Not Include Tax & Gratuity.Book online! Don’t have two hours? Then the “Laredo Tour” (In Memoriam – Laredo Larry Webster) is the tour for you. 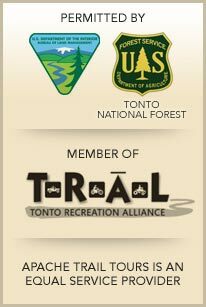 The two hour “Dutchman Tour” travels through the Tonto National Forest into the picturesque Sonoran desert. Marvel at the beauty of the western face of the Superstition Mountains, Weaver’s Needle and Blacktop Mesa. And as you listen to the Lost Dutchman’s tale imagine what it would have been like sitting in a covered wagon, all the while knowing that around the next bend you could run across an Indian Camp or an ol’ wily prospector. History, legends and lore abound on this fabulous adventure that we’ve been told is “better than the Indiana Jones ride at Disneyland”! Minimum 4 Paid Adult Fares.